To celebrate National Ramen Noodle Day, we’re diving deep into the salty, savory, and spicy world of ramen. 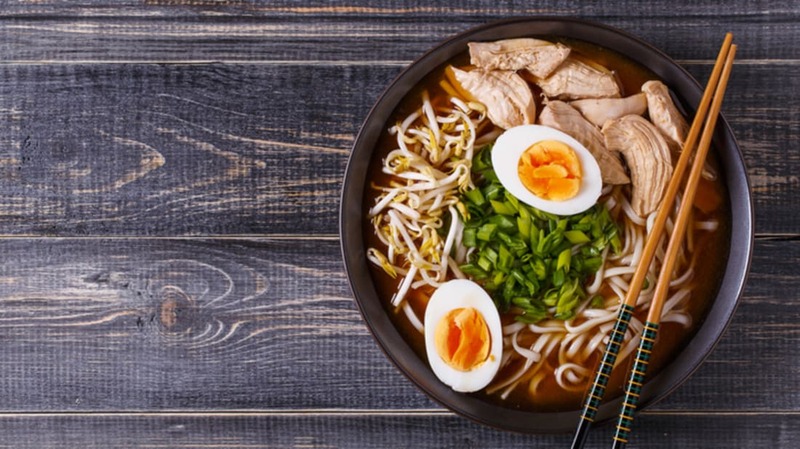 Ramen usually contains some combination of noodles, broth, meat, and vegetables, but the classic Japanese dish's ingredients and cooking method can vary considerably across regions. So whether you’re a ramen purist or are open to experimenting with more unconventional bowls, take a look at some of the best ramen in all 50 states. This Pan-Asian neighborhood restaurant in Birmingham’s Loft District serves a pork broth ramen packed with flavorful veggies such as tree ear and shiitake mushrooms, carrots, and bean sprouts. If you want to add meat to your ramen, you can choose between pork belly, chicken, beef, tofu, and shrimp. This casual Japanese restaurant serves bowls of warm, savory ramen to hungry Alaskans. Opt for the Alaska Ramen, with a hearty broth made from halibut, chicken, and miso. To create an even more authentic experience, the restaurant plays Japanese television shows which you can watch while you wait for your ramen. If you think a doughnut shop is the wrong place to find excellent ramen, think again. Welcome Chicken + Donuts serves doughnut sandwiches, Korean Fried Chicken, and a top-notch Tonkotsu-style ramen. It comes with alkaline noodles, house-made pork bone broth, and tasty fixings including braised pork belly, kimchi, fish cakes, and a marinated egg. Vegan ramen lovers can order the Vegan Ramen, which comes with roasted vegetable broth, mushrooms, and braised jackfruit. With both a food truck and a brick and mortar restaurant, The Southern Gourmasian makes it easy for Little Rock residents to satisfy their ramen cravings. The restaurant’s decadent ramen bowl contains pork shoulder, smoky dashi (a Japanese soup stock), and a perfectly poached egg. Los Angeles and San Francisco have large Japanese-American populations, which gives Californians a multitude of superb, authentic ramen options. But for something more unconventional, head to Momona, a noodle and bao restaurant in Northern California. Get the Chico Ramen, which magically incorporates elements of Japanese and Hawaiian cooking. The dish contains roasted chicken dashi, Hawaiian-style chicken, kale chips, pickled shiitakes, garlic schmaltz, and an egg. If you’re craving custom-made noodles, savory broth, and fresh ingredients, head to Uncle. This ramen shop in the Lower Highland neighborhood serves a variety of ramen bowls, including pork, kimchi, and duck. But order the Spicy Chicken Ramen for a delicious mixture of spicy sesame broth (simmered for 16 hours), tahini-soy-chili, and bean sprouts. If you’re up late on a Friday or Saturday night, head to Midnight Ramen, a sushi restaurant that transforms into a ramen shop when the clock strikes midnight. The Spicy Miso Ramen will tantalize you as you sip broth that’s been simmered for 10 hours and munch on springy noodles, bamboo, and a soft-boiled egg. At Ramen Kumamoto, located near the University of Delaware, it’s all about the noodles. Patrons can specify their preferred level of noodle firmness (extra soft, soft, firm, or extra firm) as they sit back in an authentic setting, manga mural included. The best dish is the Tan Tan Ramen, a spicy chicken broth with yellow wavy noodles, miso sesame paste, minced chicken or pork, and bean sprouts. Mizner Park’s Kapow Noodle Bar combines Japanese, Vietnamese, and French cooking styles to create a unique, mouthwatering menu. Order the Pork Belly Ramen Tonkotsu for a generous serving of wheat noodles, pork belly, a six-minute egg, preserved bamboo shoots, and mushrooms. Because the broth simmers for 48 hours, it's flavorful, rich, and meaty. This spectacular craft ramen restaurant serves custom-made noodles, local produce, and cage-free, local farm eggs. Try the creative Duck Ramen or Lamb Tsukemen, which contain ingredients such as cilantro oil, garlic chili oil, and lamb bone dipping broth. If you want to electrify your taste buds even more, order an extra Spice Flavor Bomb, which gives you an explosive dose of Thai and Korean chili paste. And if you love your meal, the restaurant encourages you to buy a beer for the kitchen staff, which sounds like next-level tipping to us. Hawaii has plenty of excellent ramen, and Gomaichi stands with the best of them. The restaurant imports sesame seeds from Japan and roasts them in-house each day for a truly authentic ramen experience. Order the Chicken Shoyu Ramen for a savory, salty dish. Yoi Tomo might draw crowds for its sushi, but the ramen is the real star. Chewy noodles, spicy broth, scallions, a red cabbage garnish, and sesame seeds round out the ramen, which is available on the dinner menu. Good news: Students and faculty at nearby Boise State University get a small discount. If most ramen you encounter tastes oily and heavy, consider trying Ramen Takeya. The Spicy Chicken Paitan Ramen features egg noodles, pork belly, and marinated bamboo shoots in a light chicken broth, made with bones from cage-free chickens. A soft-boiled egg, mushrooms, onions, scallions, and chili complement the savory flavors. At Ramen Ray, the Spicy Miso is a favorite because of its abundance of sweet corn, reddish brown miso-based broth, and perfectly soft-boiled egg. And if you’re not super hungry, don’t fret: All ramen dishes are available in half portion sizes. Located on Clinton Street, Seoul Grill may sound like the best spot for Bibimbap or Bulgogi rather than ramen. But this inexpensive restaurant’s Korean twist on the Japanese dish will expand your mind and your taste buds. Get the Rice Cake Ramen, which comes with a sliced rice cake and egg, or the Korean Ramen, served with veggies. Drawing inspiration from the flavors of Honolulu’s Chinatown, Ramen Bowls offers a huge selection of decadent ramen. The shop makes its own noodles and miso (including vegan and gluten-free options), and the Loaded Kimchi Ramen is amazingly fresh. Picture a huge bowl containing chicken broth, thin noodles, slices of pork belly, a braised egg, Napa cabbage, spinach, fried leeks, seaweed, and scallions. Loaded indeed! Situated just one block from the Ohio River, MilkWood serves hungry Louisville residents some of the best ramen in Kentucky. The Seafood Ramen—coconut lobster broth, toasted nori, and a fried catfish cake—is a creative way to inject classic Southern flavors into the Japanese staple. Umami is named for the taste sensation of savoriness, and it delivers on that promise. Whether or not you imbibed too much the previous night, order The Hangover, a ramen dish consisting of fresh noodles, spicy miso broth, braised marinated pork, a soft-boiled egg, shiitake mushrooms, and spicy chili garlic oil. Pai Men Miyake also serves sushi and sake, but ramen is this restaurant’s forte. The Kimchee Beef Ramen is bursting with flavor, thanks to its spicy miso broth, braised short rib, fried shallots, and the aforementioned kimchi. Ren’s Ramen treats its noodles seriously. The restaurant imports wavy noodles from Sapporo in Hokkaido (an island of Japan), then ages them in a temperature- and humidity-controlled environment. Don’t miss the Sapporo Style Shoyu Ramen, a soy sauce ramen with pork broth, roast pork, bamboo shoots, bean sprouts, onion, garlic, and scallions. The downtown spot Shōjō delights customers with its Shiitake Mushroom Mazeman (ramen without broth). Because it lacks broth, the mazeman lets Shōjō’s springy noodles shine without being drowned in liquid. If you want to turn your ramen experience into a truly decadent feast, order a side of the duck fat hand-cut fries, which are served with Sriracha aioli. At Johnny Noodle King, noodles are treated like royalty. Take a seat and dig into the Shoyu Ramen, made with a hearty mix of pork, chicken, and fish broth. The dish also contains your choice of pork belly or shredded pork, fermented bamboo shoots, an egg, cured fish surimi, and nori. Self-professed "Ramen Specialists" run this Minneapolis ramen shop, and they expertly deliver the goods. The Tonkotsu South Side Ramen is excellent as is, but you can add to the dish’s pork bone marrow broth and egg noodles by ordering extra toppings such as nori, wood ear mushrooms, and bamboo shoots. An oyster bar in Jackson probably isn’t the first place you’d go for great ramen, but appearances can be deceiving. Every Monday evening is Ramen Night at Saltine, and patrons celebrate by chowing down on ramen bowls overflowing with crawfish, Andouille sausage, corn, a soft-boiled egg, nori, and scallions. This spot in downtown St. Louis offers pork, shrimp, and tofu ramen. If you’re tired of typical wheat noodles, order the Spicy Laksa Ramen (egg noodles in a roasted shrimp broth) or the vegan-friendly Local Tofu Ramen (rice noodles and vegetables in a mushroom broth). Midori is a casual sushi and sashimi spot in Kalispell, but don’t overlook the ramen, which is some of the best in Montana. The family-owned restaurant serves a simple yet classic ramen with your choice of miso or spicy beef broth, soft noodles, two half-boiled eggs, vegetables, scallions, and sesame seeds. When you’re craving a rich, comforting bowl of ramen, Omaha’s Ika Ramen and Izakaya hits the spot. Order the Shio Ramen, which features hearty chicken broth, barbecued pork, pickled ginger, scallions, and an egg. And to impart a dash of vinegary flavor, get the house kimchi add-on. With two locations in Chinatown and Henderson, Monta brings delicious ramen to customers all over the greater Las Vegas area. Go with the classic Tonkotsu Ramen, which has a thick, creamy pork-based broth, thin noodles, two slices of pork belly, wood ear mushrooms, bamboo shoots, and green onions. Inspired by Japanese and Korean cooking, Sushiya offers a mouthwatering Miso Kakuni Ramen. Brimming with seasoned pork belly, mushrooms, and bean sprouts, the dish delivers the perfect amount of heat, thanks to the spicy miso and beef bone broth. This popular ramen shop (its name is Japanese for "older brother") offers customers six thoughtfully crafted ramen options. Although No. 2 (Miso) and No. 5 (Mazeman) are nourishing and delicious, you’ll be craving No. 3 (Spicy Miso), which contains chicken broth, pork, and bean sprouts seasoned with roasted chili oil. At O Ramen and Curry House, the ramen is warm and the broth takes time to perfect. Chefs allow 24 hours from start to finish to prepare the broth and noodles, and you can taste the care that goes into dishes such as the Tofu Ramen (fried salt and pepper tofu, bamboo shoots, ginger, and scallions). Manhattan is a major culinary destination for ramen, and popular spots such as Ippudo and Momofuku top many critics’ lists of the best ramen in the Big Apple. But head to the Lower East Side for Mr. Taka Ramen, where two childhood friends from Japan serve tantalizing dishes such as Yuzu Shoyu Ramen, a white soy sauce flavored chicken and bonito fish broth with whole wheat noodles, yuzu citrus, and leeks. As you enjoy your ramen, sip from a bottle of house sake, served hot just like the soup bowls. Located in downtown Durham, this two-story Japanese ramen spot and pub serves ramen on both floors of the building. Don’t miss the Shoyu, which contains local ingredients such as North Carolina catfish cured surimi, shredded smoked local pork, and pickled mustard greens. Whether or not you came to Fargo for the noodles, Drunken Noodle & Wasabi undeniably serves up some of North Dakota’s best ramen. The casual restaurant serves a variety of noodle dishes from Vietnam, Thailand, and even Italy, but go straight for the Crispy Pork Belly Ramen, one of the spot’s House Special Noodles. This noodle house puts a creative spin on classic ramen ingredients and flavors. While you can’t go wrong with the Fried Chicken or Spicy Sriracha Ramen, the Hangover Ramen is the real star. The dish’s crispy bacon and pulled pork enhance the pork miso broth, and the addition of potato, kimchi, and egg pushes the comfort level to the next level. Gorō began as a series of pop-up dinners called Project Slurp, but now Oklahomans can enjoy slurping (and eating) at a brick-and-mortar location on Blackwelder Avenue. Get the Red Curry Mazeman for its thick, filling noodles or the Spicy Sesame Ramen, which comes with chicken broth and pulled pork shoulder. With two locations in Portland, Boke Bowl makes ramen and dim sum to die for. Options such as Shrimp Dashi and Caramelized Fennel Dashi come with handmade noodles and the option to add house-brined smoked tofu or cornmeal-crusted oysters. Customers who are gluten-intolerant can get yam noodles, which are worth trying even regardless of dietary precautions. When you arrive for lunch at Iron Chef Masaharu Morimoto’s restaurant, aptly named Morimoto, you know you can't go wrong with any menu option. The Pork Belly Ramen’s noodles and soft cooked egg are cooked to perfection, worthy of any Iron Chef title. Choose soy broth for a lighter meal, or go with the pork broth for a richer experience. Ken’s Ramen checks a lot of boxes: It’s delicious, comforting, and it’s healthy! Order Ken’s Vitality Veggie Ramen to taste an insane broth made of daikon, shiitake mushrooms, and sea kelp. Yellow wavy noodles and fresh seasonal veggies round out the bowl. Keep in mind that Ken’s is cash only, but there’s an ATM inside. Whether you’re in Myrtle Beach or Charleston, CO has you covered when it comes to ramen. With a chef hailing from Japan and dishes such as Vietnamese Ramen—with egg noodles, pork broth, pork belly, shredded pork, a poached egg, and bok choy—you can’t go wrong. Oshima Sushi serves everything from sashimi to hibachi, and the restaurant lets you order a little bit of everything. The cozy spot offers Special Ramen Combos, letting guests get a few California Rolls or Spicy Tuna Rolls with their Seafood Ramen. With two locations in East Nashville and Chattanooga, Two Ten Jack serves Southern-inspired ramen to loads of hungry Tennesseans. Don’t miss the Yasai Shoyu, a vegetable broth-based ramen with collards, burnt corn, pickled ginger, and black garlic oil—and don't even think of asking to take leftovers home. The restaurant insists that their ramen be served fresh and piping hot so they don't allow you to ruin the experience by boxing some up for later. Ramen Tatsu-Ya is so legit that it might be among the best ramen in the U.S., let alone Texas. Declaring that ramen is the soul food of Japan, this restaurant offers plenty of add-ons, such as a corn bomb (butter and honey), spicy bomb (red pepper paste), and chili bomb (a blend of five chilies). Get the Mi-So-Not, a pork bone broth with the usual ramen accouterment, or the Mi-So-Hot, the spicier version of the dish. Tosh’s Ramen is tasty, plain and simple. While the Curry Ramen and Vegetarian Ramen (with yam noodles) are awesome, the Karai Ramen takes the flavor to the next level with its spice-infused ground pork, copious noodles, and crunchy bean sprouts. Founded by three friends united in their love for ramen, this restaurant near the University of Vermont campus is the go-to spot for the best ramen in the Green Mountain State. Order the Tonkotsu Ramen for a healthy dose of pork broth, chashu (pork belly), bamboo shoots, mushrooms, and scallions. Since 2015, Yona has delighted Virginians with its inventive take on ramen. With chicken broth and meatballs, the Chicken Noodle Ramen is the perfect bowl of Japanese-style chicken noodle soup. And the Maryland Blue Crab Ramen is a locally influenced dish with a spicy, salty crab broth. With locations in Bellevue, West Seattle, Olympia, and even Japan and Taiwan, Kizuki is the real deal when it comes to ramen. Don’t miss the Yuzu Shio Ramen, which contains kelp, Japanese citrus, and French sea salt. And if you're not on a date, order the flavorful Garlic Tonkotsu Ramen. This upscale restaurant near the Kanawha River serves sushi, steak, and (of course) ramen. Never had asparagus in your ramen before? Get the Tokyo Ramen to taste the green spring veggie in a comforting chicken and soy broth. Described by reviewers as flawless and perfect, the ramen at this Madison spot is top-notch. Order the Spicy Ramen (with chicken, bok choy, and wood ear mushroom) or the Veggie Miso Ramen (with deep-fried tofu, nori, and seasonal vegetables). And don’t worry about spilling—just ask for a ramen bib and slurp to your heart’s content. Situated in a historic log cabin, this restaurant doesn’t specialize in Japanese fare, but the Vegetarian Ramen Noodle Bowl just might fool you. Pickled carrots, microgreens, and roasted mushrooms marinate in a savory broth, and meat lovers have the option to add crispy duck breast or pork belly.